Palestinian Islamists Rob The Cradle……. – The Tundra Tabloids……. Palestinian Islamists Rob The Cradle……. 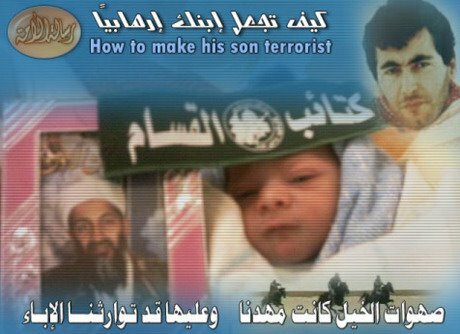 The folks at MEMRI have posted a series of images produced by the Izz al-Din Al-Qassam Brigades on their website, that show how the jihadist are abusing their own children. Tiny tots dressed with messages of jihad across their brow, are shown being introduced into the world of violent “Islamist Extremism” through the medium of the Internet, filling their little minds with visions of Kalashnikovs and mayhem, instead of the Middle Eastern version of Sesame Street. Previous Post Previous Post Gothenburg Hit by Blackout And Riots……. Next Post Next Post It Couldn’t Be Any Plainer…….